The title of this article incorporates a joke, which pokes fun of the fourth seen from the Symphonie Fantastique. The Symphonie Fantastique is one of the greatest compositions that should be on everyone’s list of favorites. Hector Berlioz was way ahead of his time when he composed this masterpiece. There are many aspects that one could enjoy from this piece. From this score, Berlioz became the first to write an autobiographical composition, which told the story of his life through a symphony. He was the first to implement the Idee Fixe (fixed idea) that became the forefront of this composition and weaved in and out of each movement and connected his ideas and thoughts. Because this melody was so prominent, it allowed him to become much more creative with his choices of chords and progressions and take what was known about theory and compose to a whole other level. Before we go into length and dissect this wonderful piece, please allow me to give a small background of this wild and crazy guy. 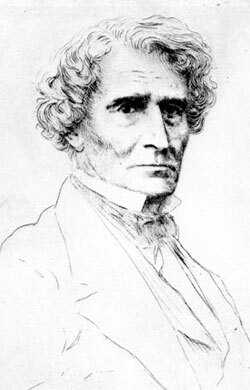 Hector Berlioz (born December 11th, 1803 in a small town in France and died 1869) was not born a prodigy, and he did not know much about playing an instrument either. He knew a little flute, clarinet, flageolet, and he could strum a few chords on the guitar, but by no means was he a virtuoso at any of these instruments. Hector Berlioz’s father was a doctor and wanted Hector to become one as well. He sent him to study and become a doctor but, when he saw the sight of a dead corpse that a friend of his had bought to work on for a class he basically got sick and quit the whole medical concept. His father grudgingly gave Hector the money to study music, but he said he would stop paying for the music school that he was to study at and any lessons that he was supposed to take if he didn’t do well. His father didn’t like “second-rate” people. 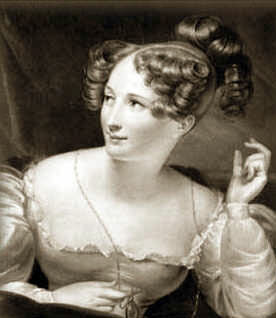 One day, Hector had seen a Shakespearian play that employed an actress by the name of Harriet Smithson (1800-1854). He quickly became madly in love with her. So much, that one would say he was crazed or obsessed! Eventually he married Harriet Smithson, and thus the Idee Fixe (the fixed idea) and unifying element was written to describe her through within the five movements of the Symphonie Fantastique. What sets this music apart as a Romantic piece rather than a Classical period piece is that it was programmatic in nature. In other words, it told a story with the music. It also incorporates expressive musical content, expresses complex emotions and paints pictures. There was literacy involved with this piece. It included a program (almost like a libretto) that described what each movement was supposed to sound like and what was happening to the characters. The orchestra was bigger; it contained longer melodies, stronger harmonies. In the Classical era, form shapes the expressive content. In the Romantic period expressive content shaped the form. Being the very sure Frenchman that he was, Hector Berlioz wanted his own sound. He wanted the instruments themselves to supply the meaning of the text, rather than the voice. This makes the music become a bit more abstract than it ever has. He started this piece in 1829 and finished it in 1830 (which was the year he graduated from the conservatory where he studied musical composition). It is fun to listen to how the Idee Fixe (fixed idea) changes upon the mood swings he feels about her. The first movement is entitled the “Reveries and Passions.” Here the Idee Fixe is introduced. It is hauntingly beautiful in nature and expresses the love that the “artist” (himself) feels for the subject (Harriet Smithson). The second movement is entitled “The Ball.” This piece has a three over four time signature (waltz) and describes a dance. But what is outstanding in this movement is that the Idee Fixe becomes this intertwined, in a back and fourth type of idea that gives the impression that he is thinking of her even when he is dancing at the ball – trying to forget her. If one were to think on a deeper level, one might think that this represents conscious and unconscious of ones self. The third movement is entitled, the “Scene in the Country.” He begins to have doubts about her love. The music becomes stormier and the psyche develops a feeling of “she loves me, she loves me not, she loves me, she loves me not.” This music happens to be pretty close to Sonata form. It has somewhat of a exposition, followed by a development section, which is followed by the recapitulation section. This movement ends with a sigh from the violins as if to say, she loves me not and all hope of her loving him is dashed away. The fourth movement is entitled, “The March of the Scaffold.” The character takes a strong dose of opium (a hallucinogenic), which made him have these strange dreams. He dreamt that he killed his beloved. He also dreamt that he witnessed his own death that was done by an execution. He was led to the scaffold by cart, through the streets. The people who witnessed this (during this movement) threw tomatoes and other rotten vegetables at him. During this movement one of the most famous descriptive moments in music happens, when he gets to the chopping block, he has one more thought of his beloved. This is interpreted again by the Idee Fixe, which is performed by a solo clarinet. Suddenly, (interrupted) the blade comes smashing down, WHAM! 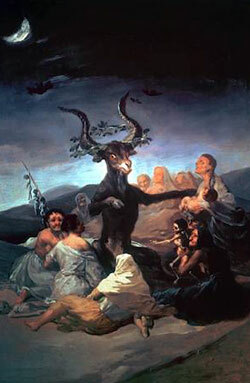 The head is chopped off and is demonstrated by three plunks by the violins, in an eerie descending fashion.The fifth movement is entitled, “The Dream of the Witch’s Sabbath.” He sees himself amidst ghosts and monsters that are laughing at him, poking fun at him and teasing him. Now, the theme (the Idee Fixe) becomes evil sounding. This represents that his beloved is now shown as an evil, wart-bearing witch. She does a cruel gig, played by the upper register of an Eb clarinet. This is shrill like, and adds to the texture and picture of this evil and degrading moment. Now, he does not desire her love nor does he want her by his side anymore. Yes, folks it is like seeing his life before your very eyes. How dramatic! How crazy and insane! How wonderful! Wow... I learned a lot about Berlioz. Good work!